More wildlife than just birds visit bird feeders, and every birder must be willing to share the occasional snack with a furry guest rather than a feathered one. When deer become regular pests, however, they will quickly drain feeders and cause other problems. Savvy birders can easily protect bird feeders from deer without distressing any wildlife. Hearty Appetites: Deer feed constantly, and when they find an easy, tasty food source, they quickly polish it off, including emptying out even large bird feeders. Because deer are social and move in herds, the cost of continually refilling feeders can be damaging to any birder's budget. Garden Damage: Deer don't confine their foraging just to bird feeders, and once they find a bird-friendly backyard, they will also browse on flowers, gardens, and even trees. Their hooves may trample plants, and they will rub their antlers on trees and fences, splintering wood and causing additional damage. Droppings: Deer do not have the most efficient digestive systems, and their droppings, while they can be great fertilizer, aren't always welcome all over the yard. Because many deer droppings are small, they can be difficult to clean up. Feeder Damage: As deer try to access a bird feeder, they may knock over poles or pull feeders down from hangers, and can break or chew into the feeder to access seed, suet, or nectar. Deer have powerful teeth for continual grazing, and they can do significant damage to even sturdy feeders. Neighborhood Nuisance: Deer do not stay confined just to birders' yards, and they will also visit neighbors' yards and cause the same types of problems in the garden or flowerbeds. This can cause friction between neighbors and create unpleasant tension if one neighbor perceives that feeding the birds is attracting deer. Parasites: Deer can harbor a range of harmful parasites, including ticks, fleas, and lice, which can carry diseases to other animals as well as humans. When deer are in the yard, these pests can become established and be a problem for anyone nearby. Accidents: As deer become common in a neighborhood, they are more vulnerable to car collisions or other accidents that may result in extensive damage or injuries to vehicle occupants. Deer can be persistent visitors, but there are many different tactics that can safely discourage them. Take Down Feeders: Deer won't visit a yard if it has nothing to tempt them, and removing bird feeders temporarily can encourage deer to move along. Taking down feeders at night is critical, since many deer are more comfortable in neighborhood areas or closer to buildings after dark. Clean Up Feeding Areas: Deer happily graze on spilled seed under feeders, but with their huge appetites, they will quickly turn to emptying the feeders themselves. Only offer enough food for birds to eat in one day, and clean up spilled seed to eliminate this convenient food source. Elevate Feeders: Deer can be tall and may stand on their hind legs to stretch toward feeders. If feeders are positioned at least 7-8 feet above the ground, however, deer are much less likely to reach them successfully. Try Bitter Foods: Deer won't eat every type of birdseed, and bitter-tasting seeds such as safflower and Nyjer aren't to their general tastes. Opting for seeds with hot pepper treatments can also deter deer, but birds don't mind the spiciness. Store Seed Safely: In addition to protecting feeders, extra seed and bird foods should be stored out of reach of deer. Storing extra food in a shed or garage is ideal, or use a sturdy container with a latched or locked lid that deer will be unable to access. Use Motion Sensors: Deer can be skittish and will shy away from unexpected motion or noise. Rigging motion sensors on powerful sprinklers, flood lights, or noisemakers can quickly deter deer. Install Fences: Deer can jump fences, but a broad fence or thick, dense shrubbery border can keep them out of yards because they do not tend to jump across wide areas. A double fence with 2-3 feet between layers is a good option to keep deer out of the yard. 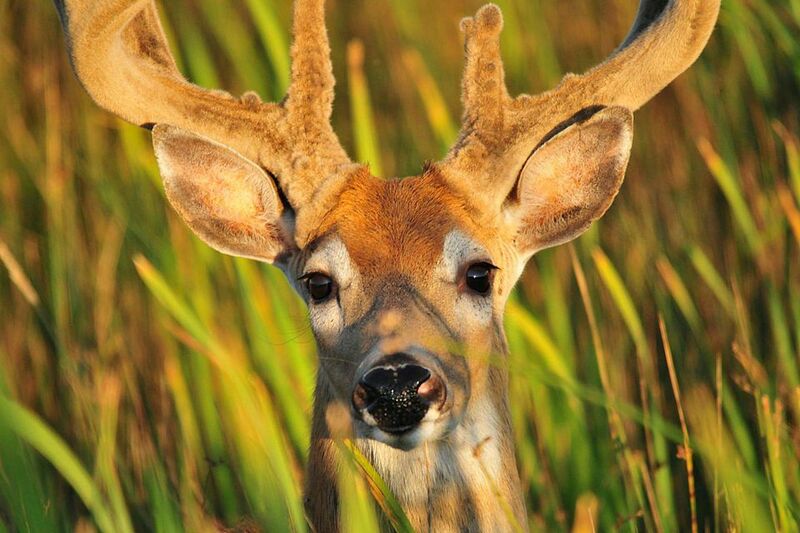 Make a Stink: Deer have sensitive noses and will often stay away from strong, suspicious odors. Hanging strongly scented soaps, clumps of human hair, or mothballs near feeders can keep deer away, or planting aromatic herbs such as garlic, chives, or lavender in the yard can discourage deer from visiting. Choose Deer-Resistant Landscaping: Deer eat many backyard plants, but choosing thorny, inedible plants will take away their snacking options and encourage them to move on. Barberry, roses, holly, columbine, lupines, Russian sage, and yarrow are all popular deer-resistant plants. Deer can be quite canny and will become accustomed to the same deterrent methods. The best way to keep them out of the yard is to combine different tactics and switch techniques periodically to keep deer on edge and away from the area. If deer are still visiting the yard despite conscientious efforts to keep them away, it may be necessary to contact local wildlife officials for assistance. At no time should steps be taken to kill or injure deer (actions which can result in significant fines or other legal penalties). Encouraging neighbors to take their own steps to make the neighborhood less deer-friendly can create a combined effort that keeps deer away, and birders can enjoy the visits of their feathered friends without feeling disrupted by deer.